The year 2011 commemorated the 75th. Anniversary of the opening of the first Butlin Holiday Camp at Skegness in 1936. In October of that year I attended a Redcoat Reunion at the Grand Hotel in Scarborough and had such a wonderful time I decided to dedicate a website page to the memory of an amazing man and the organisation that bears his name. This is not a history of Butlin Holiday Camps, much of that has been well documented elsewhere, but will be an occasional reminiscence of my time with the company and my thoughts specifically on the entertainment values provided by the fabulous '"Butlin Redcoats" those wonderful teams of boys and girls in red and white whose job it was (and still is!) to entertain the millions of holidaymakers who visited every year. I have already made several periodic references on the Newsletter page and will be reproducing them here. Anyone who ever visited a Butlins Holiday Camp in the 1950's '60's '70's or '80's will enjoy reading this book. If you ever WORKED there as a Redcoat during that time then YOU MUST BUY IT! 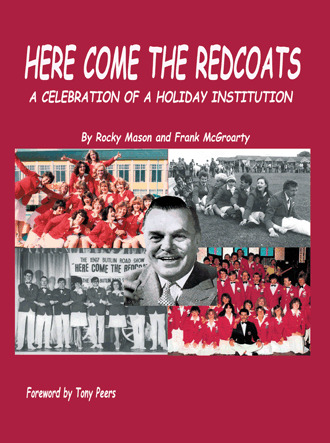 Written jointly by Rocky Mason and Frank McGroarty (One from the earlier years and one from more recent times), "Here Come The Redcoats" tells the true story of how it really was! With pages and pages of photographs from all of the camps and hotels, plus contributions and reminiscences by many of the Redcoats who were there, this is a most nostalgic reminder of the days when the Great British public really knew how to enjoy itself! Published by Authorhouse at £11.99 Plus p.&p. Give yourself a real tonic and buy this book now! 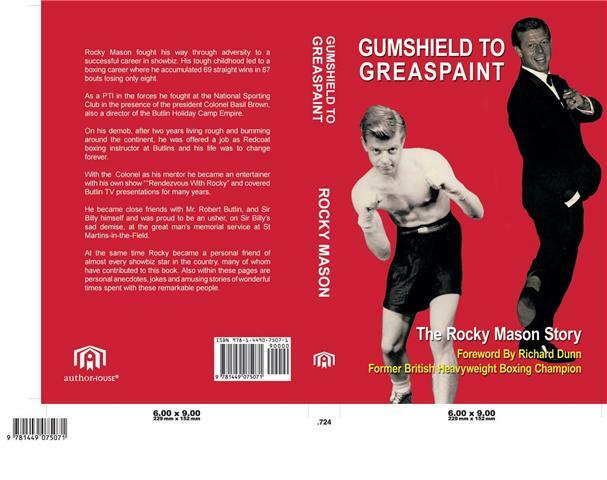 Another Butlins related book that I have recently enjoyed is "Gumshield to Greasepaint"
It is the autobiography of Rocky Mason who, towards the end of the second world war, as a ten year old living in Bradford, took up boxing. He was very successful as an amateur, but decided not to turn professional. Instead in the mid 1950's he joined the Entertainments Department at Butlins Holiday Camp, Filey and became a Redcoat Boxing Instructor! Rocky stayed with the company for 30 years, rising through the ranks to become a senior executive manager! The book is a warm and nostalgic look back at the early hardships in his life and how he used them in a positive way to lift himself upwards. The book was particularly enjoyable for me because I too spent a number of years working for the Butlin organisation (although nothing like as many years as Rocky! ), some of it in the company of the author, who remains a friend to the present day! If you were ever a holidaymaker at a Butlin Camp between 1954 and the late 1980's, you may have met and even been entertained by Rocky! If so you will want to buy this book and relive those memories. Even if you were never there, buy the book and see what you missed! "Gumshield to Greasepaint" is a great read. It costs £10.99 plus shipping. and I personally recommend it to you. Click here for purchasing details. WHAT MAKES A GOOD REDCOAT? I wrote the following on the 8th. of March, 2009 in response to a newspaper article. "University offers degrees in the finer arts of being a holiday camp Redcoat"
The Daily Mail yesterday carried an article with the above headline and sub-headline. It seems that The University of Chichester are sending student Redcoats to Butlins, Bognor Regis to learn the skills of singing, dancing and performing. Also they will learn stage management and pyrotechnics! Those who succeed will leave with a two year foundation degree in Technical Skills for the Arts and Leisure Industry! I read this article with much interest. I was a Butlin Redcoat & Entertainments Manager between 1960 and 1965. How times have changed! The criteria set by The University of Chichester bears no resemblance to that of Billy Butlin, the man who invented the Redcoat. His definition of a good redcoat was one who would mix and mingle with the holidaymakers; to perhaps dance with them and give them friendly encouragement to participate in the various activities that were provided (competitions etc.). Most of all a good redcoat made the customer feel valued and important! All of the qualities of a GOOD HOST! If a redcoat could sing, dance, play a musical instrument or do magic tricks – that was a plus. Many of the best redcoats that I ever worked with could do none of those things! They were the ones who in a rare off-duty moment, would as a matter of choice, take their cup of coffee or tea and go and sit at a table in the coffee bar with a family of new arrivals and ask them how they were, what were their names and was this their first visit etc. etc. These were the redcoats the holidaymakers would talk about long after the holiday was over, with whom they would often take up correspondence – and whom they would seek out on their return the following year! The customer takes for granted the talented performers – that is what they are paying for and come to expect. The thing that impresses is the feeling that this 'glamorous' person in a red jacket whom they barely know has noticed them and wants to be their friend! And whilst tastes in entertainment have obviously changed, Billy Butlin's concept of what makes a good redcoat has not! Holidaymakers are still impressed with the personal touch and that will always be the case! Unfortunately these skills cannot be acquired in a classroom. You can certainly teach backstage theatrical technical skills and artistic performing techniques. But they would be better learned in a dedicated theatre school. In any case, having all of those skills at your fingertips will not necessarily make you a good Redcoat! YOU REALLY HAVE TO BE A 'PEOPLE' PERSON! Many would-be 'Stars of the Future' unfortunately are not! Andy King was exactly the kind of Redcoat of which I spoke in the above comment. He was originally recruited as a backstage technician/stage manager/theatre lighting operator. No obvious on-stage talent. He began his Butlins Career at the Skegness camp in 1954. Frank Mansell, the then Entertainments Manager saw something in Andy that prompted him to offer the young man additional Redcoat duties. And so Andy performed as a General Duty Redcoat during the day and theatre technician in the evening. He returned the following year and again in 1956. He came back in 1961 for a further three years completing six years with the company in 1963 - all of these years at Skegness. I tell you about Andy now because he passed away last Wednesday (27th. November 2013), surrounded by his family at the age of 82. I never worked with Andy, although we were with the company at around the same time. But I got to know him through his postings on the on-line Butlins Memories Forum. He wrote regularly, under the name 'Skegred', reminiscing and posting many photographs taken during his time at Skegness. I replied to some of his comments and during the last few years we became friends. There was mutual delight when we able to finally meet at a Redcoat Reunion in Scarborough in 2011. The point of all this is to show that of his 82 years, only six summers were spent at Butlins in Skegness; and yet he never forgot his time there or the people he met (staff and campers alike). It is the same for many of us, I was there for only five years, some for a shorter period and others longer. And yet the experience is the same - we became different people because of our time at Butlins. We have never forgotten and we remember with affection the Andy Kings who have gone before. Another ex-Butlin Redcoat is Chris Whitelaw. Since the passing of Andy King, there has been much sadness among those of us who regularly contribute to 'Forever Butlins', a Facebook Group dedicated to staff from all departments who have served the company over the years. Chris recently posted the following piece that he had composed. It struck a nostalgic chord with most of us. I asked him permission to include the poem on this page and he graciously agreed. gone is the time to play. – it’ll be the best one yet. and warms each Redcoat heart. and heard the crowds all roar. knows they went there with our love. "Our true intent's - for your delight". that it’s there where we belong. In the Butlins camp above. Some time ago, I was reading a short biography about Al Bowlly, the popular U.K. radio and recording star of the 1930's and came upon some interesting information that throws light on the introduction of this iconic, end of evening Butlin camp song. “Goodnight Campers” is the song with which ballroom entertainment came to an end, each evening in every Butlin holiday camp (and hotel). The Redcoats would line up in front of the bandstand and the campers, also in lines across the ballroom floor, arms linked and facing the Redcoats, sang along; legs gently kicking from side to side in time to the music. The tradition began to die out in the early 1970's when the style of dance music changed along with the partying tastes of holidaymakers. The warm sense of camaraderie radiated by the singing of the evocative chorus resulted in the song being adopted by Pontins and other holiday camp organisations. But 'Goodnight Campers' is a Butlin song through and through. I believe its conception (and perhaps even its actual birthplace) was Butlin's at Clacton-on-Sea in 1938. The melody comes from a song written by English composer and song writer, Ray Noble in 1931 entitled 'Goodnight Sweetheart'. This song was first recorded by Al Bowlly, who was singing and recording in the United States with Ray Noble's orchestra. At that time, Al Bowlly was Britain's biggest radio and recording star and could be said to be the U.K.'s very first pop idol. Ray Noble became successful in America - and in demand. He was offered a contract to play for 'The George Burns & Gracie Allen' hit radio show. However the show already had singers and so Al Bowlly returned to England. Upon his return, Bowlly continued making records; often with the then popular Lew Stone Orchestra, and in 1938 joined the band for a summer season's engagement in the ballroom of Butlins Holiday Camp in Clacton. 'Goodnight Sweetheart' had by this time become a huge hit with both American and British dance band audiences. Because of its romantic lyric and sentimental feel, it was the 'smoochy' song that was invariably played at the conclusion of an evening's dancing. Although played in 'slow-foxtrot' tempo, it was the the equivalent of a 'last waltz'. Having been introduced to the world by Al Bowlly during his time with Ray Noble, 'Goodnight Sweetheart' was Al's song and so it was only natural that he would perform it in the ballroom at Butlins with Lew Stone's band. No one seems to know exactly when or by whom the words were changed to 'Goodnight Campers'. Perhaps by Lew Stone or one of his musicians. Maybe even Al Bowlly, having fun with the holidaymakers, began playing with the words as the season progressed. Or perhaps (as I prefer to think) the new words were written by Billy Butlin himself, on seeing the warm and emotional effect that the song was having on his customers at the end of another wonderful day of entertainment. It would be just like the man to recognise the value in taking one of the biggest hit songs of the time and changing the words to promote his own company. There is no doubt that seventy years on, in the subconscious minds of millions of people in Britain, when they hear the evocative tune, even without the words, they are transported back to the happy times of Butlins in their youth. Here is Al Bowlly singing "Goodnight Sweetheart"
Goodnight Campers, I can see you yawning. Goodnight Campers, see you in the morning. that folks die in bed! Bring the bottles back tomorrow! I hope the above has awakened a few happy memories. I worked for Butlins for five years in the early 1960's and it feels like only last week! More Butlin Songs from way back! I mentioned earlier that I was employed in the Entertainments Department of Butlins in the early 1960's. However my first experience of Butlins was in 1939 (yes that's right, 1939!) when I was taken with my family as a small boy to the Clacton Camp. Just as you will find on modern holidays, Butlins had produced a souvenir recording of some the songs and dances played in the Ballrooms. This music was sold on two 10" records and of course many families would buy them. Our copies were in my family for many years but unfortunately became either lost or broken with the number of our family house moves in the ensuing period and it wasn't until 2009 that I was able to source copies. An interesting fact for Butlin historians, is that the M.C. hosting all the singing and dancing introduces himself as 'Norman'. It therefore seems likely, considering the 1937/'38 date of the recording that it is the voice of Norman Bradford, considered by those who know about these things to have been Butlins very first Redcoat! (You will find several references to Norman Bradford in the book, 'Here Come the Redcoats', described earlier). In addition to 'Goodnight Campers', there were a number of songs that holidaymakers were encouraged to sing - 'The Hi-De-Hi' Song, 'Penny on the Drum' and the '1-2-3-4 Song' were particularly catchy. 'Penny on the Drum' continued to be sung into the 1950's when teams of Redcoats would sail into bars and ballrooms with a big base drum at the end of the evening and help to clear the venues of happy campers! Holidaymakers attached themselves - 'Conga' like - to the Redcoats who, after a couple of circuits around the bar would lead everyone outside - where the line would disperse and folk (slightly the worse for wear!) made their way back to the chalets! so please put a penny on the drum. come and join our happy party. come and join our happy throng. repeated from the top ad-finitum! NB: Penny on the Drum was not an original Butlin song - The late Stanley Holloway, actor and monologuist recorded the song in the early 1930's. I believe that the song was a gentle send-up of the Salvation Army who used to go into public houses, collecting for charity. and Penny on the Drum. If any of you remember singing these songs - particularly the last two - then you must really be a good age! - So well done! THE MARIE DE VERE DANCERS. During my time at Butlins (1960 to '65) the Resident Revue Dancers at all of the Butlin camps were supplied through the agency, by Marie De Vere. Recently, while in conversation with a colleague of the same period, I mentioned a tap routine performed by the dancers that was regarded as a De Vere 'Speciality.' - dance troupes in those days had their own individually choreographed routines that were identified as exclusively theirs - and other dance troupes stayed clear. The routine in question was a fore-shortened orchestration of Franz von Suppe's 'Poet & Peasant Overture' and lasted around four minutes (the duration of the full score is about ten minutes). It is a wonderful piece of music containing a variety of changes in time and tempo; and it is this melodious variety that lends itself so beautifully to the cleverly choreographed tap sequences. I would love to know who was responsible for the choreography and if there was ever any filmed footage taken at any time. So, if there are any ex-De Vere girls out there (I suspect that there are quite a few!) who can throw some light on my quest, I would be delighted to hear from you. I just recently had an exchange of emails with 'Lynne' (no second name!) on the subject of the Poet & Peasant dance routine referred to above. Hi. I don't know how long this thread has been on here, but today I decided to browse my old dance troupe. And hey, what did I find. This. I danced for Marie in Pontins Morecambe in 1967. We revived Poet and Peasant for the season. Boy was it hard work. Even now, if I hear the tune my feet start to move..Thanks for the memories. Lynne. Hello Lynne, Thanks for writing. I remember the girls at both Clacton and Bognor Regis (between 1960 and '64) dancing to Poet & Peasant. Do you know if Marie DeVere herself choreographed the piece? I thought it was one of the best routines I had ever seen! Hi Leslie I can only assume she did. I do remember her saying that one of her troups had danced it with great success at the Paladium, I think, but that's all I remember. We (there were 5 of us new girls) were put into a studio in the old Covent Garden and had three weeks to learn 8/9 numbers, before being sent to a freezing cold and damp Morecambe holiday camp (Pontins). You are right it is an amazing routine and I am proud to have danced it. I hope that revives memories for a few others - do let me know! Contact me here if you can help - or even if you only want to reminisce about your days as a dancer at Butlins. I am always ready to exchange stories of that wonderful time! I have received a request for information about Andrew Rankin Crookes & Elizabeth Frances Cranfield who were thought to have been Butlin Dance Instructors in the late 1930's. You would have to be a good age to remember them at Butlins but it is possible someone knew them at a later date.